You’ve heard me write and talk quite a bit about Ted Dintersmith, an education activist and philanthropist, whose perceptions and obsessions overlap substantially (but not completely) with mine. I have particular fondness for Ted because we are in lockstep in how we see the toxic state-level educational experience imposed by the toxic Florida state government. 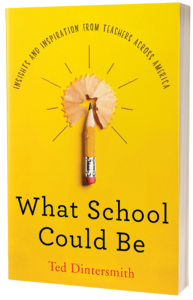 Ted’s new book, “What School Could be,” is a travelogue of sorts. He went to all 50 states in search of joy, creativity, and purpose in educational experience. In the course of that trip, he came to Florida. I saw him on his visit to Lake Wales, where he was very critical of the Florida Model. See this post for an account of that discussion that I wrote during the 2016 campaign. Me [Dintersmith]: I believe that the more test-driven a school is, the more it puts kids at risk in a world of innovation. KM: You’re making this too complicated. Educating children is like fixing a car. You take a car to the garage and pay them to fix it. We pay our schools $7,000 per student and expect them to be educated. Me: How do you know they’re learning anything? KM: That’s why we have standardized tests. When I started to respond, KM stood up and informed me, “Look. I’m important to the governor. Thank you for your time.” And left. In a year with a thousand meetings, this was the worst. This official Florida state government point-of-view: I’m very important; you’re not; and your child is just a broken car to meis the reason I ran for School Board. And it’s the reason I won overwhelmingly. It’s the reason I continue to do what I do. I don’t believe your child is a broken car. I don’t believe our teachers are interchangeable lug wrenches. I don’t believe we have to choose a government that believes that. I campaigned on that. Repeatedly. Loudly. I worked, relentlessly, to convince the public — which our leaders deliberately seek to confuse — that it need not endure the your child is a broken car model. I worked to convince the public it has a choice. Given that choice, the public responded. Overwhelmingly. That’s why I’m gunning for Kelli Stargel, politically, with everything I have. And will not stop. She thinks my child — and yours — is a broken car. DoE thinks your child is a broken car. So does Rick Scott. So did Barack Obama and Arne Duncan and George W. Bush and Jeb Bush. VAM was a terrible Democratic idea around 2010 that was discredited years before Stargel used it to sabotage and harm teachers and kids in her home county. The Florida Model has been the bipartisan American model. Now most of America is starting to move away from it; Florida and Kelli Stargel are doubling down. If the public understands its choices, I’m confident it will toss her out of office. Ted’s meeting is very helpful in that understanding. Go back and read it. Your current government thinks your child or grandchild is nothing more than a broken car. Change that government; and you can change the model. In part 2 of this piece, I’ll focus on what it means that Florida can simultaneously have the worst test score growth in America for individual kids and brag about its slightly higher than the national average performance on a sampling test called the NAEP. UNITE AND FIGHT FOR PUBLIC EDUCATION! !!!! I am continually validated in my thoughts about education in Florida having taught before the FCAT,etc., and sending two daughters through the system after reading your blog. One daughter served by gifted ESE in Sarasota, IB Diploma, UF Finance and MBA. Students like her will make it despite this wicked system. The average student is the one punished by this teach to the test system. Teachers cannot teach to anything, but the test! The system is “dumbed down”,and these demigogues who think they know about educating humans are ruining lives,and wasting time. All the while Jeb Bush still makes money the test? Is this still true?